•The Hack stream order is an alternative method for assigning a hierarchy to the river network. Starting at the mouth of the river the route to source is labelled 1. 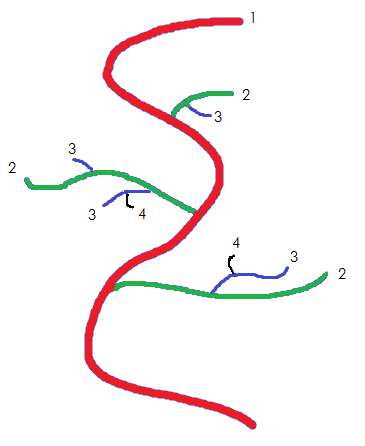 All tributaries and their route to source are labelled 2, all tributaries of these and their route to source are labelled 3 and so on. A stylized example is shown below. •To attribute the network with Hack Stream Order you must have already encoded the network with source ID using this tool. •RivEX uses the source ID to determine the route to source (the furthest distance upstream) when traversing the network assigning the Hack Orders. RivEX does not use catchment area, it is the network distance that defines the source location. •Selecting this tool opens the following dialog, there is nothing for you do but press OK to start the process. If any of the fields are displaying NOT SET then you need to run the appropriate tool to generate the field. This tool will not run if any fields are displaying NOT SET. •The output is an Integer field called Hack. If the field exists already then a new field will be created with a numeric suffix, for example Hack1. Hack Order is typically applied to single threaded networks, usually derived from DTM's. 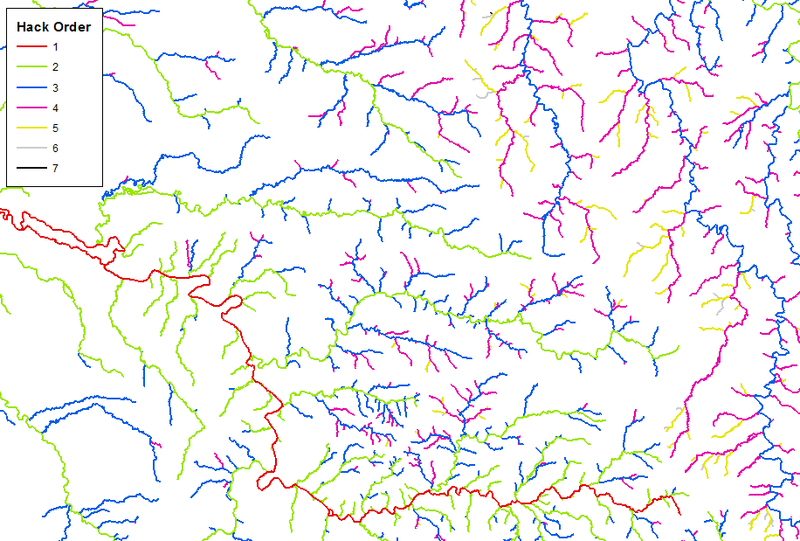 Your vector river network may contain loops or highly braided sections. So how does RivEX deal with those? RivEX uses the source ID value to help it traverse the network when determining the Hack order of a polyline. Once a source ID value has been found this is logged and RivEX continues with the traversal of the river network. 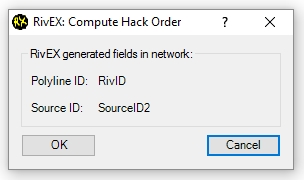 RivEX then applies the Hack Order to polylines with the same source ID. In Braided sections many polylines will have the same source ID so they all share the same Hack Order. assigned the same Hack order value.